Well, Rupert Murdoch is going to love this. More people around the world get their news online from Google News than from CNN or the news properties of the New York Times. In November, 2009, according to comScore, Google News attracted 100 million unique visitors worldwide, making it a larger news site than CNN (66 million) or the combined properties of the New York Times (92 million). But do you know who is even larger? Yahoo News, with 138 million unique visitors worldwide. Funny how you never hear Murdoch complaining about Yahoo News. Still, the top two sources of news online are Yahoo News and Google News, followed by the New York Times sites and CNN (China’s QQ.com News would come in fifth with 53 million visitors a month, followed by the BBC and MSN News with about 48 million each—the Wall Street Journal Online is way down the list with only 6.8 million). Google News is the orange line in the chart above. He suggests that people trust Google more for unbiased information than news brands. 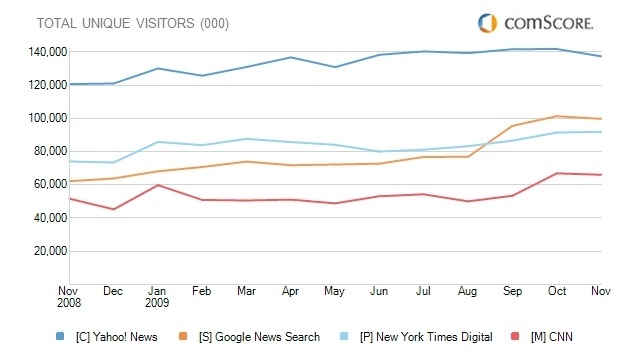 The value of news brands are diminishing and being replaced by more straightforward search. Brands are about relationships, whereas search is about transactions. A deeper look at the data bears this out. 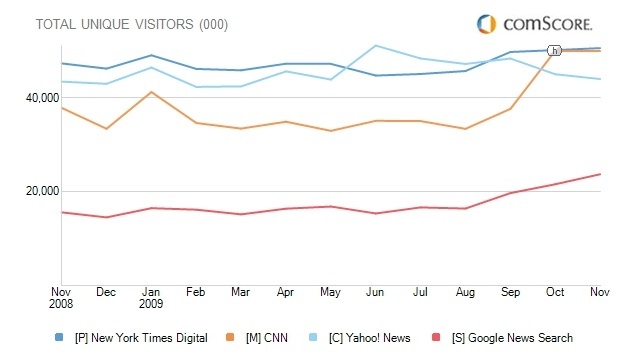 While Google News has more visitors on a global basis than CNN.com, people spend a lot less time there. In November, visitors spent nearly 2 billion minutes at CNN.com versus 840 million minutes on Google News. CNN generated 1.8 billion pageviews, while Google News produced 656 million. Another thing to keep in mind is that Google News and Yahoo News both have many more individual country sites than CNN or the New York Times. So they have an advantage when comparing global visitors. In the U.S., Google News is still smaller than both, with about 24 million monthly unique visitors compared to 50 million for both CNN and the New York Times sites. (See chart below). Yahoo News has 44 million, so there is still hope left for traditional news sites. As I’ve argued in the past, Google doesn’t control the news, it exposes it. What news sites decide to do with that exposure and use it to build longer-lasting relationships is up to them. Update: comScore is in the midst of switching to a hybrid data model which includes both panel and server data, but not all sites are measured that way yet. For instance, CNN is, but Yahoo News isn’t. So if you compare apples to apples, and use only the older panel-based data, CNN would be at 38 million uniques compared to Yahoo News’ 44 million.